I am a huge fan of color. They play an important role in our world and tell us more information than we realize. In my research on colors I found the Farnsworth-Munsell 100 hue test and was fascinated being able to test myself on a skill I have held close to my heart. 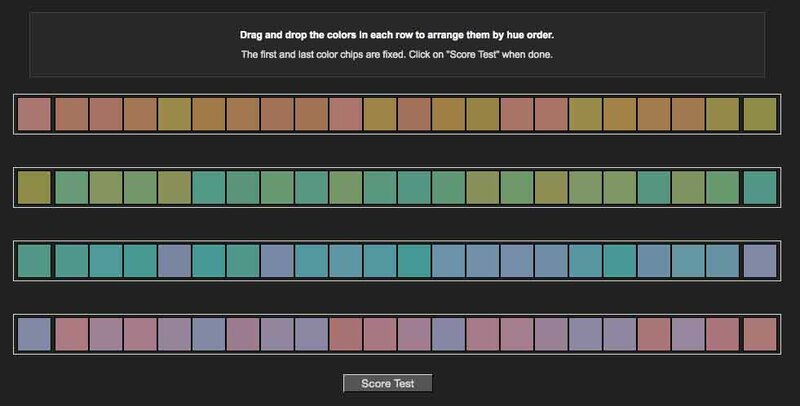 This test is used for human’s visual systems and color blindness by using blocks of color and placing them in the right sequence. Pretty easy right? So there are 2 tests you can take a quick one and a 10 min one. The shorter test is easier and only takes a couple min. A fun little challenge before trying the full test. The shorter test is easier and only takes a couple min. A fun little challenge before trying the full test. I got this one perfect first try, and I don’t think this one is as difficult. I gave myself 5 min on the longer test and it still felt rushed. I got a 22 my first try and went back and moved a few tiles around to get a perfect score. Give yourself maybe 10 min for a more accurate score. No need to rush it. The shorter test is easier and only takes a couple min. A fun little challenge before trying the full test. So there are 4 rows of colors and each row the end tiles are fixed. Use your curser to move the tiles of color to create a smooth transition from one end of color to the other. That’s it. Super easy. The test measures how many times you misplaced a tile and how far the tile is away from where the tile is supposed to be placed. Lower test scores show a more accurate color vision.